History: John Brush, gunsmith and Publick Armorer, responsible for the city Magazine, built the original structure around 1717. 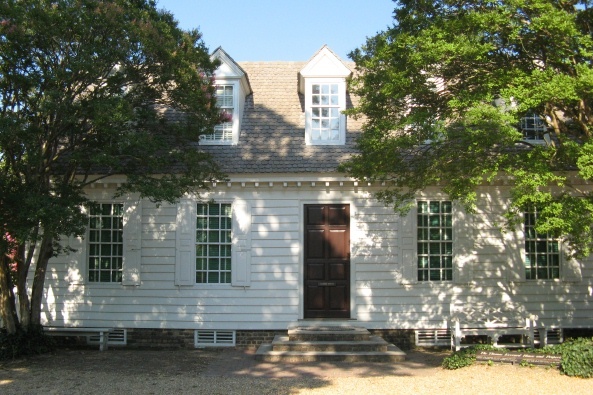 Thomas Everard, clerk of York County, owned the house between 1755 and 1781 and may have added the back extensions. Structure: This house probably started as a story and one-half, one-room deep house with a central entrance and hallway and a staircase in the hallway. A room was later added behind each front room, giving the house a sort of "U" shape. Chimneys: The house has two interior chimneys that were built on the back wall of each room of the original structure. After the expansion, each chimney then provided fireplaces for the front and back rooms.